After nearly two years of relentless campaigning, debating, speechifying, fundraising, handshaking, advertising, attacking and counter-attacking, the 2008 election has mercifully come to an end---and you won! Congratulations, or as we Latinos would say, felicidades. We appreciate the attention you’ve given us as you pursued our political support. As you can see from the vote count, we delivered. And we’re proud to be part of the broad coalition of voters sending you to the White House. Looking back, it was a political feast. The epic battle between you and Hillary Clinton for the Democratic nomination, and John McCain’s historic selection of Alaska Gov. Sarah Palin, the first woman on the Republican ticket, made it an election to remember. And as with any feast, there are lots of leftovers. For starters, there are questions to pick through about what happened and what comes next. It’s time to think about what your administration will look like, and what it should accomplish in the first one hundred days. A lot of Latino voters are probably anxious to find out how you, our president-elect, are going to improve their lives and address issues that matter to them. And rather than passively wait and see how it all turns out, now is the time for the Latinos to take a more active role by laying out demands and setting expectations. They certainly have the right. After all the courting that went on in this election---by both parties, in English and Spanish---and the role that Latinos played in deciding the outcome, America’s largest minority has a majority stake in the new administration. First, what issues matter most to Latino voters? You might be surprised. To listen to the elite media---reporters, editors and producers whose knowledge of all things Latino often doesn’t extend beyond mariachis and mojitos---you would think that the only issue that Latinos care about is immigration. There is an assumption that all Latinos favor more open borders, laxer immigration policies, and amnesty for illegal immigrants, and don’t care about much else. Mr. President, that’s way off base. Like other voters, Latinos are concerned about the economy, gas prices, home foreclosures, Social Security, education, health care, a pair of ongoing wars and the possibility of more, and a variety of other issues. They also care about immigration, especially at a critical moment like this. With nativists and opportunists having poisoned the national mood and given the debate a bitter anti-immigrant flavor, Latinos told pollsters leading up to the election that it had become one of the top issues that would help them decide who to support for president. Even the usual tribal divisions began to fade away, as Cuban-Americans, Puerto-Ricans, Dominican-Americans, and other Latinos recognized that the debate wasn’t just about Mexicans but that a common language and culture were also under assault. For instance, when Rep. Tom Tancredo---a Republican presidential candidate who has long been a nemesis to Mexican-Americans--- referred to Miami as a “third world country,” it was Cuban-Americans who took offense. One thing that makes this population of voters difficult for the media to peg is that they’re unpredictable. Ironically, that’s one reason they’re so heavily pursued. The majority of them are registered Democrats, but as “cafeteria voters” they’ve demonstrated their willingness to vote for moderate Republicans. In fact, according to some political experts, Latinos vote more often for the person than the party. And they’re becoming more sophisticated all that time, demanding that candidates not simply rely on gimmicks such as speaking Spanish but try speaking to their concerns. Some of these concerns seem contradictory. Latinos are an entrepreneurial people who appreciate tax cuts, but they also feel comfortable with growing the size of government in order to get services that they need. With a long and proud history of military service, they’re usually hawkish on defense issues---especially after 9/11---but they lost their appetite for the Iraq war early on. They care about civil rights, but a majority of them still oppose gay marriage. And, even as they raise their children to be rich and powerful, they think government should not just cater to the rich and powerful but serve all people. Mr. President, we’re talking about a population of more than 47 million people that will account for one in four Americans by 2042. 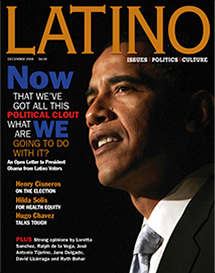 At various points during this political season---from the Iowa caucus to the South Dakota primary, through the summer hiatus, and into the general election---pundits assured us that Latinos would play a prominent role in the 2008 election. They thought that the historic candidacy of New Mexico Gov. Bill Richardson, the nation’s only Latino governor, would inspire Latinos to come out to the polls. But a funny thing happened. While Richardson won support from white voters who thought him the most qualified in the Democratic field, he never caught on with Latinos. Perhaps because of his last name, his mixed heritage, or the fact that he didn’t have a record of championing Latino causes, in the early primaries, Richardson typically came in third among Latinos behind you and Hillary Clinton. But even as Richardson’s stock dropped, the stock of Latino voters kept rising. And, it seemed, everyone wanted to buy in. In the primaries, there were ads in Spanish and debates in Spanish. Republicans even participated which was odd given that the GOP is generally friendly to divisive efforts to declare English the national language of the United States. Latinos did not determine the nominee of the Democratic Party. If they had, that honor would have gone to your opponent, Hillary Clinton, who worked hard for Latino votes. Even though Hillary lost the Democratic nomination, she never lost the support of Latinos. They voted for her over you by a decisive margin of 2-to-1. And they remained committed to her long after she exited the race. In fact, in August, a Wall Street Journal/NBC poll found that only about half of those who supported Clinton planned to vote for you. One in five planned to vote for McCain. One imagines that includes many Latinos. Even though other polls showed you leading McCain by the same 2-to-1 margin going into the election, the Democratic nominee’s support among Latinos never seemed all that deep, especially among those elderly voters most likely to vote. A lot of that may have had to do with loyalty to Hillary Clinton and resentment over how she had been treated, including the fact that she was never even vetted for the Vice President slot that eventually went to Delaware Senator Joe Biden. In one of the most slanderous stories in this election, some pundits suggested a more sinister motive for Latinos not supporting you. They implied that because of tension on the job, in schools, street gangs, and prisons Latinos were racist and thus resistant to the idea of voting for a black man for president. Curiously, it was a charge not leveled at white women or senior citizens, two other demographics that preferred Clinton by wide-margins. Granted, I never understood Hillary’s almost magical appeal among Latinos. Sure, as any ethnic marketer will tell you, this population is---whether we’re talking candidates, diapers or detergents---famously brand loyal. And the Clinton brand is as strong as ever. But, the hard truth is that, neither Bill nor Hillary has much of a track record of helping advance Latino interests. From Yale to Arkansas to the White House and Senate, the Clintons’ world, and their worldview, is what television was in the 1950’s: black-and-white. Speaking of Mexican food, Clinton didn’t get off to the smoothest of starts in her courtship of Latino voters. Speaking to supporters at a Mexican restaurant in Las Vegas, she was trying to make the point that Americans’ destinies are intertwined like, she said, “chips and guacamole.” Condescension with a dash of stereotype isn’t very appetizing. Bill Clinton wasn’t the last person to try to convince Latinos that they’d play kingmaker in this election. I was in the room when you did the same thing, in July, at the annual conference of the National Council of La Raza (NCLR) in San Diego. You told the audience, “Make no mistake about it: the Latino community holds this election in your hands.” Some of the most competitive contests in the fall, Obama noted, would probably be in states like Florida, Colorado, Nevada and New Mexico---all of which have large Latino populations. In addressing the same audience a day later, McCain also made the case that Latinos would help decide the election. And the Republican tried to use his military service as a way of connecting with a population that knows all too well the price of freedom, having sent children off to war for generations. He also played up his hard-earned reputation as a maverick and his record of championing comprehensive immigration reform even when it meant butting heads with members of his own party. It was a formula that worked for McCain in Arizona, where he walked off with 65 percent of the Latino vote in his 1998 Senate re-election and 70 percent in his 2004 re-election. The candidates’ speeches to the NCLR were part of a summer tour of Latino organizations including the National Association of Latino Elected and Appointed Officials (NALEO) and the League of United Latin American Citizens (LULAC). If there was one theme that ran through these appearances it was, of all things, a disagreement over whether McCain had flip-flopped on his approach to immigration reform. You said he had, insisting that McCain used to support comprehensive reform and now trumpets an enforcement-first approach. McCain insisted that he had always supported the idea of having enforcement and a pathway to legalization for the undocumented in one bill. From the looks of it, Mr. President, you got the better of the matchup. That made sense. This was about integrity. Latinos needed an ironclad reassurance that McCain wasn’t just a fair-weather friend and that he would stand by them even when the angry mobs stormed the White House. If he was the sort of tell-you-what-you-want-to-hear politician who would cave into pressure, then what good was it to have him in your corner? And, as it turns out, the predictions were correct: Latinos did play a prominent role in the election, and not just in terms of casting ballots. Latinos made their presence felt throughout this election by inspiring fear: of the demographic shifts sweeping the country, of the changing face of America, of the prevalence of Spanish, of the sense that immigrants aren’t assimilating, of a changing culture and all the rest of it. Many Americans are terrified of all those changes, and this was the first presidential election where they really felt comfortable putting those fears on the table and demanding that they be addressed by whomever was seeking their votes. Luckily, in the end, the politics of fear washed out as both political parties went on to nominate candidates who refused to bash Latinos or demagogue the immigration issue. In fact, on immigration, both candidates arrived at positions that were virtually identical. For instance, you both promised you would support comprehensive immigration reform. Throughout the campaign, both candidates reached out to Latinos in their own ways. McCain marked Cinco de Mayo by launching a Spanish-language website, unveiled an outreach effort called Unidos con McCain, recommitted himself to achieving comprehensive immigration reform, and talked about his experience serving in Vietnam alongside Latino comrades. You equated the struggles of civil rights leader Rev. Martin Luther King Jr. and United Farm Workers President Cesar Chavez, pointed out that you had worked with local Latino leaders as a young civil rights attorney in Chicago, talked about how many in the Latino community came here “with so little but a thirst to succeed” not unlike your immigrant father from Kenya, and hired Patti Solis Doyle, the Latina who served as Hillary Clinton’s campaign manager. In the run-up to the election, both candidates continued to make overtures to Latinos in the hopes of earning just enough of those votes---or, rather, keeping just enough of it away from their opponent---to win the contest. The Latino community was never far from your minds, it seems. So, now that the election is over, Latinos have to make sure it stays that way. Mr. President, consider this an open letter to your new administration. When you get there, we expect you to remember our contribution to your success. We know that you’ll be looking for a way to repay us for our support, and we have some concrete suggestions, both in terms of policy and personnel. As for policy, we expect you to make good on your promise to take on comprehensive immigration reform as a top priority. But, as we have tried to make clear throughout this election, the Latino community is not a single-issue constituency. On education, we want you to work with Congress to reauthorize No Child Left Behind, the educational reform law that has done much to improve the academic performance of Latinos by holding teachers and schools accountable. On trade, we want you to win approval for the Central American Free Trade Agreement (CAFTA) and extend the Andean Trade Preference Act, which is set to expire at the end of 2008 and which reduces tariffs for exports from Bolivia, Colombia, Ecuador, and Peru. On Iraq, we expect you to move ahead with a timely withdrawal but not before we’re sure the Iraqi government can take control so we don’t have to send our sons and daughters back in a few years. And on the economy, we want you to support the creation of more small businesses, reduce taxes and create more jobs, especially for our young people. With personnel, we expect to see Latinos fairly represented in your cabinet with at least three appointments. And we expect one of those appointments to be in the top-tier cabinet posts: Secretary of Treasury, Secretary of Defense, Secretary of State, or Attorney General. We’re sure you’ll agree that there are plenty of well-qualified men and women---including many who are already serving in government---who would make an excellent contribution to your administration. And once they’re appointed, we expect you to stand by them in good times and bad, just as you would any other member of your cabinet. We’d also like to see Latinos appointed to the White House staff and serving as some of your top advisers. You’ll need their counsel as you try to lead a country that is becoming more Latino by the day. You might say that we expect to be full partners in your administration. And you’d be right. We’re confident that we’ve made a sufficient investment. And we’d like to build on it in the future, provided we’re satisfied with your first term. We’ll be watching, Mr. President. Ruben Navarrette Jr. is an editorial board member of the San Diego Union-Tribune, a nationally syndicated columnist with the Washington Post Writers Group, a weekly commentator at CNN.COM, and the author of A Darker Shade of Crimson: Odyssey of a Harvard Chicano (Bantam).